If you are looking for ultraviolet systems for curing -you are in the right place. 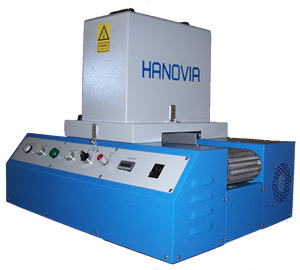 Efficiency, reliability and simplicity are designed into every Hanovia UV curing system – systems that enjoy a worldwide reputation as cost effective equipment for curing a wide variety of photocurable products. 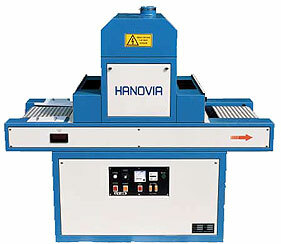 These latest Hanovia UV curing systems require less floor space, provide better accessibility and easier maintenance. 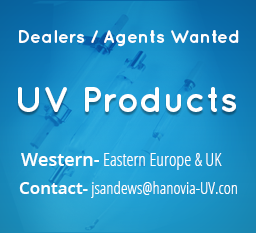 All Hanovia UV curing systems are available with multiple lamps according to your production needs. 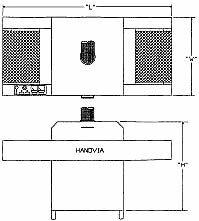 Hanovia’s more than ninety years of experience brings quality engineering and safety features to every product. And no matter what the need, there’s a Hanovia product to meet it. Higher power sources are available on request. *Add 10 amps for vacuum hold-down option. ** Add 5 amps for vacuum hold-down option. 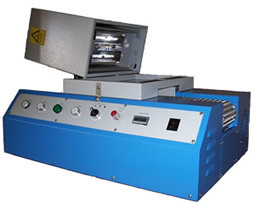 This conveyorized laboratory system provides intense ultraviolet energy for a wide variety of photo-curable products. 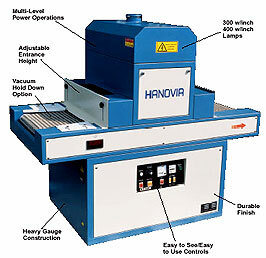 The Hanovia irradiation system incorporates a focused elliptical reflector, a 6-inch, 300-watt-per-inch UV curing lamp, a variable speed stainless steel fiber-glass conveyor belt, and an integral cooling fan into one complete tabletop curing package. The conveyor belt has a variable speed motor with speeds from 6 to 40 feet per minute. With 3 lamp power levels, most all photosensitives can be efficiently cured in conditions equivalent to an industrial production environment. Lamp replacement is simple. The removable top cover and lift off irradiator have no wires connected to them and the lamp can be changed without the use of tools. Safety interlocks cut lamp power should the cover be lifted with the lamp in operation. The control panel has a main power switch with circuit protection, a latching control power switch to prevent accidental start-up, a selector switch for lamp power level, a speed meter for conveyor speed, and a power on indicator light. We’ll meet with you – plan and install a complete new Ultra Violet System – at a low, low cost. Ask the company with over 90 years experience in the UV industry for a no-obligation survey.